So the bread I made for this bread braid was the milk and honey bread I really enjoyed this bread lovely soft and moist. 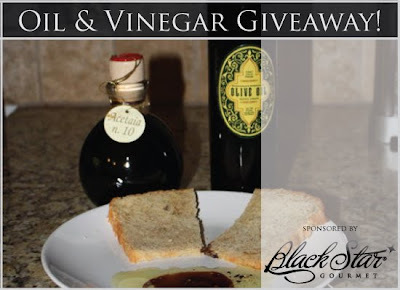 In my last post I mentioned that good bread deserves good olive oil and vinegar so I asked Black Star Gourmet if they would do a giveaway for my fellow bread makers and readers and they kindly agreed. It is with great pleasure to bring you a guest post from Pamela from My Mans Belly, this is a wonderful blog with first class recipes, good humor and relationship advice I love it. 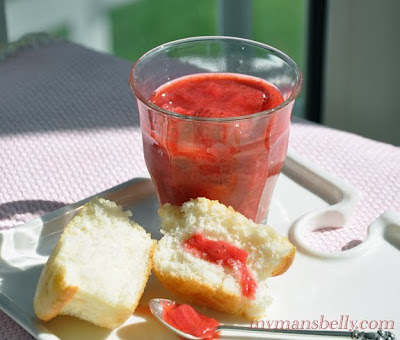 This is a special post as my Parents should be finally arriving tomorrow and Rhubarb is one of my Dad's favorite things shame she didn't post us all some of this yummy Rhubarb and Strawberry sauce, enjoy! 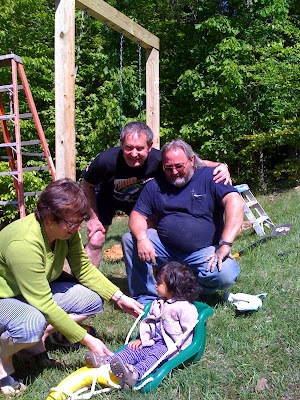 I’ve been reading Chow and Chatter for some time now and was honored when Rebecca asked me to write a guest post. Then my brain really kicked in and started taunting me with things like: What should I write? What would her readers like to see? Does anyone really want to hear what I have to say? Once my brain was done with the self-flagellation I was able to settle in to what I would write about. A trip to the farmer’s market gave me all of the inspiration I needed. It’s rhubarb and strawberry season! If you’ve ever seen those pinkish red stalks (that kind of look like a really pretty celery stalk) and never knew what to do with them…I’m here to help. Rhubarb is probably not something you want to sit down with and just start chewing on, it’s very tart. But when you mix it up with some of Spring’s fresh strawberries…now you’ve got something you can slather onto just about anything and give it a little zip of Spring. Growing up, my mom always made strawberry rhubarb pie with a meringue crust. As I got older I realized why I liked it so much. I just liked the tart filling. Thus began my lust for rhubarb sauce. I eat it all by itself, which causes my husband to cringe while watching me slurp down the tart concoction. (He is not of the tart persuasion…he would be on the sweeter side of the coin.) But if there are any baked goods around, or pancakes, I catch him spooning it on very generously. 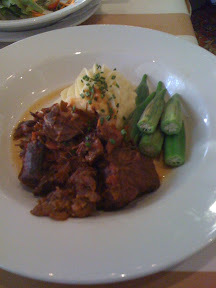 While the rhubarb sauce is tart, when it’s put onto something sweet the pucker power of it is greatly diminished. Add Strawberries, Rhubarb, Water and Sugar to a small saucepan. Cook ingredients over medium high heat until rhubarb is soft and falling apart. (This takes 20-30 minutes) Stir frequently to keep ingredients heated evenly. 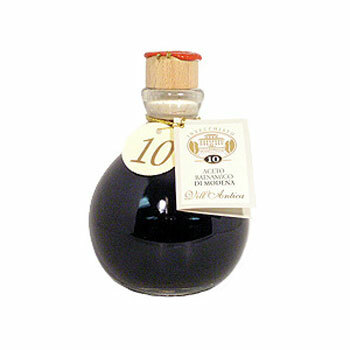 Serve by itself or over sponge cake, biscuits, toast, pancakes or even white fish. *Or add more sugar to taste. A recent study looking at the lifestyle habits of 5000 British adults found that those that smoked, drank excessive alcohol, more than 3 drinks for men and 2 a day for woman, did less than 2 hours of physical activity a week and less then 3 servings of fruits and vegetables a day had a shorter life span. They also looked 12 years older than those who made healthier choices. I made this yummy risotto the other day, with pancetta and shiitake for something different. 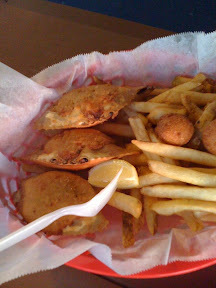 What are your favorite mushrooms? 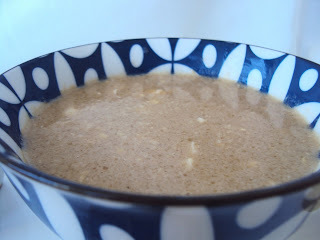 I am going to try Maiitake next! The lovely and talented Author Cherie Burbach is doing a virtual book tour and since I reviewed her book in September last year and am now her virtual friend I was more than happy to host her tour. My review is below and a link to the book. 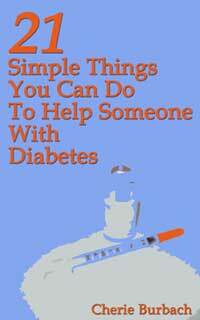 It is a great little book and a must for friends and family members to have on hand to understand diabetes better. Cherie has diabetes so her insight is priceless. I really love this little book and the concept of it. It is a quick and easy read geared towards friends and family of those with diabetes giving them down to earth and practical tips of how to help their loved ones. Cherie has had diabetes for 20 years herself and really speaks from the heart and personal experience, enriching the book. It also offers practical advice such as learning how to give shots and check blood sugar so if needed they can offer a helping hand also to keep healthy food on hand and sugar free soda when your loved one comes to visit. It suggests learning about the condition and attending support groups, with them. Its a great book I highly recommend it. My hubby had a fun days off so we decided to head down to Charleston SC for a couple of nights with my friend and her 11 month old. 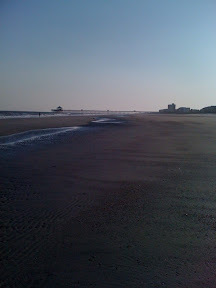 We got a great deal on a lovely cottage on Folly Beach it was beautiful and it was my friends baby first time to the beach. Jasmine had so much fun with the "Baby!" 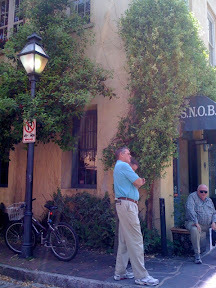 Today we ate at SNOB or Slightly North of Broad in Downtown Charleston-192 East Bay St.
Charleston, SC 29401 the wait was really long, it was recommended to me by @EatItAtlanta on twitter! 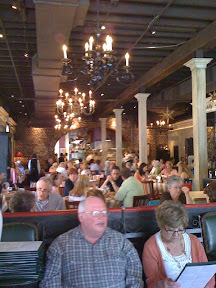 it was a great restaurant with typical low country food I would give it 7/10. 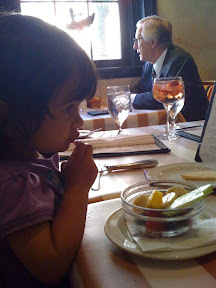 One thing I thought was great they brought little bowls of fruit for the girls before they took the order. 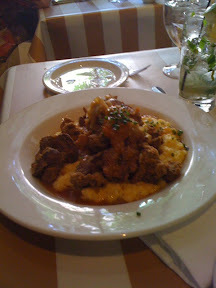 Hubby got fried chicken livers and grits very Southern! 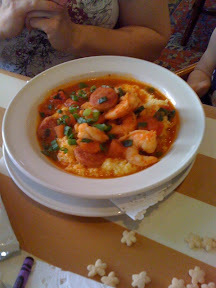 My friend got shrimp and grits with homemade sausage this was really good. 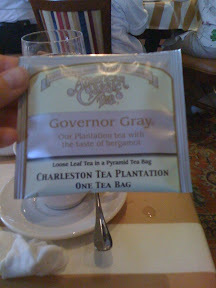 The coolest thing for me was the discovery that there is a tea plantation South of Charleston the only one in America and the tea was really good!, we enjoyed this with a slice of carrot cake no picture it was gobbled up fast! 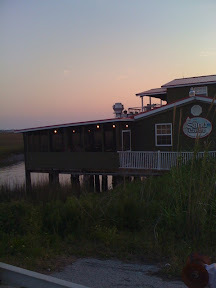 Then this evening we went to a Local seafood place near folly beach look at the Sunset! 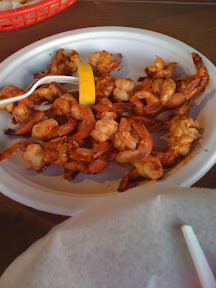 Sauteed shrimp this was yummy but unfortunately the only thing on the menu not fried! 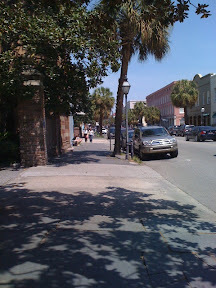 We had a lovely couple of days in Charleston, if you haven't been its a must. One of my favorite cities in the US beautiful buildings good food and Southern Charm and they grow tea!!! It is with great pleasure to introduce you to Malou she is one of the sweetest folks in the blogging World, a great Mum, amazing cook and has such a great outlook on life. 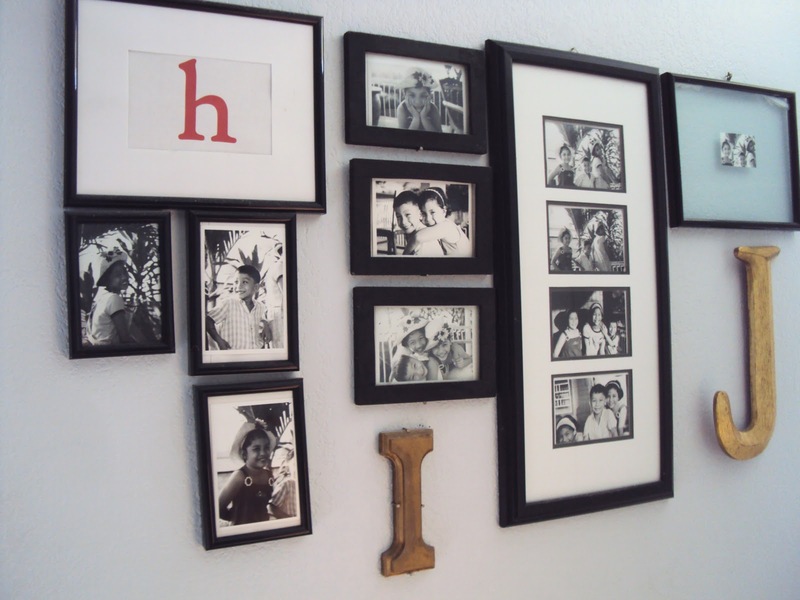 I asked her to do a guest post in her own lovely style, be sure to visit her blogSkip To Malou it always brings a smile to my face. "Heartwarming" she said... to see the last pictures we had in my hometown at about the same time in early April, one Easter weekend ten years ago. 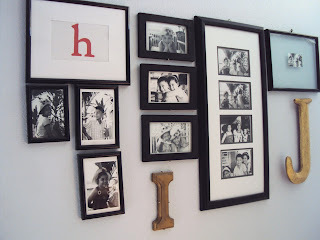 Even when we move, these pictures always find their place on the entry wall. It happened to be the last Easter we celebrated before we moved to the US. They never fail to remind us of the good times we had in the past. The nostalgic feeling led my daughter to request for one of her comfort food from my home town... and yes, which leads me to share with you the recipe of a noodle dish known in my home town as BATIL PATUNG. Sauté the garlic and onions. Add ground beef and sausage. Cook for about 4 minutes or until beef is brown and the sausage is cooked. Add the vegetables. Season it with soy sauce and oyster sauce. Adjust to taste. Set aside. De-glaze the pan using beef stock. 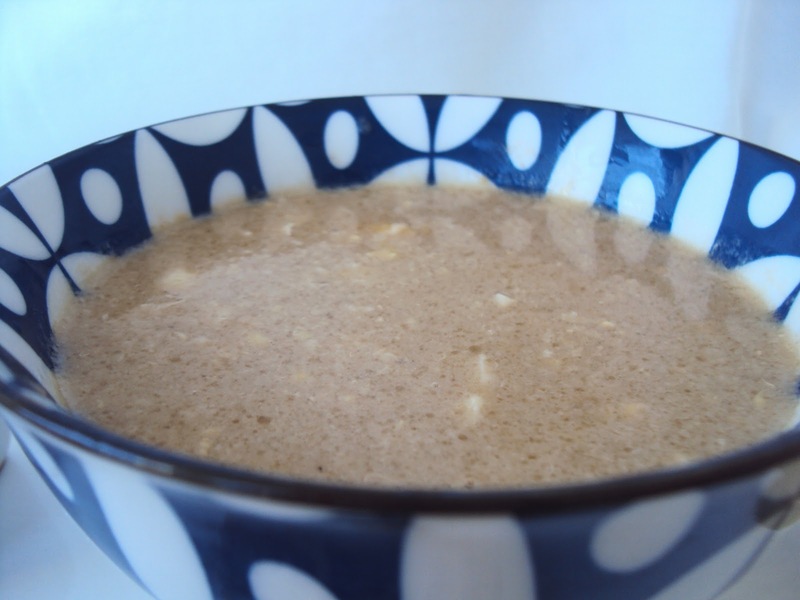 (you can also use chicken or pork stock). Add soy sauce and oyster sauce Let it simmer. When the soup stock is simmering, break an egg and stir. Pour into a serving bowl and set aside. 3. Using the same pan and with the remaining soup stock, add the noodles. 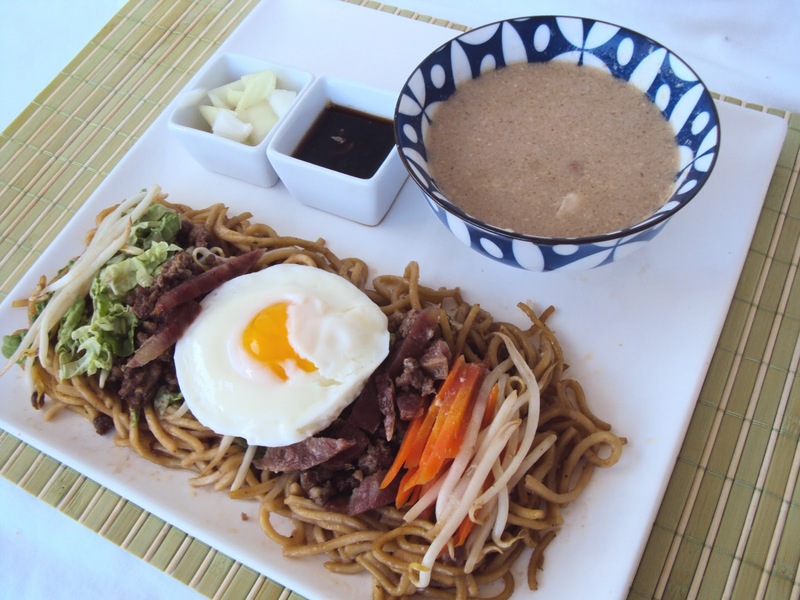 (You may add more beef stock if needed) Cook the noodles for about 3-4 minutes. 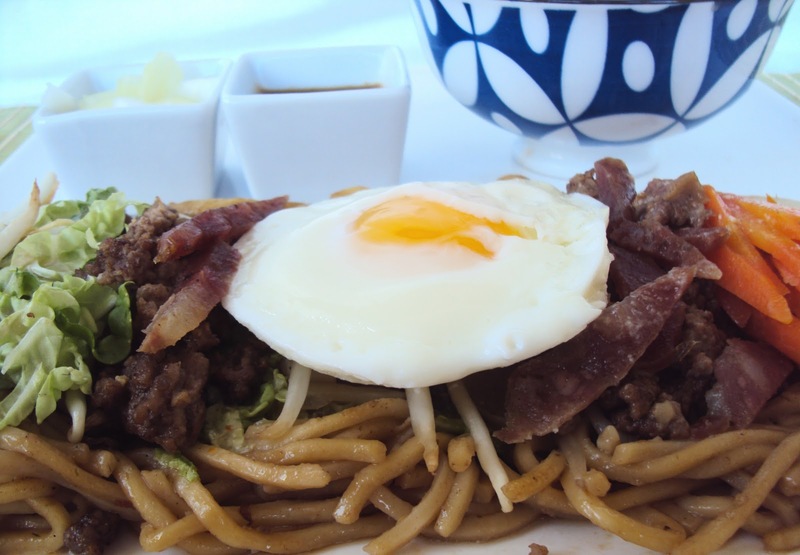 Place the noodles on a serving plate. Arrange the stir-fried beef, sausage and vegetables on top. Add a poached egg. I made this yummy lamb curry the other day on hubby's request bless him he doesn't request food often and its been ages since I made this as it takes a long time to make. After eating it though you realize it was all worth it and it makes wonderful leftovers! Our little dog Sachin (hubby named him!) also loves it when I make this as he gets the bones! Finally add the potatoes and paste and simmer for 20 min. What's your favorite dish that takes ages to make but in the end you are pleased you made it?